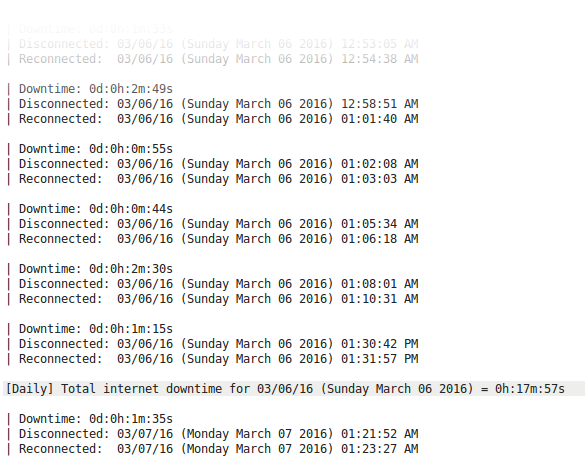 Internet Downtime Logger is a terminal application that accurately logs time spent without internet connectivity to a file with timestamps, it also adds up and logs the previous daily and monthly downtimes. 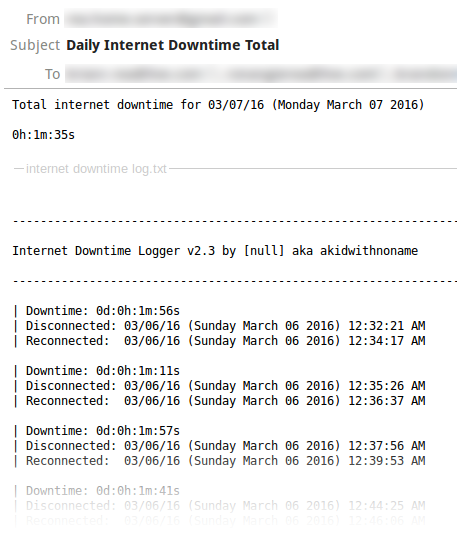 Internet Downtime Logger includes email functionality enabling you get automated notifications and will even attach the log file. There are many settings and options to configure allowing you to enable / disable features and reconfigure Internet Downtime Logger to meet your needs. You can do things like: Set different to-email addresses for each of the notification types, disable some or all of the notification types, change log file location, configure server settings, and more! I have used Internet Downtime Logger in the past to notify my ISP and get a refund for the amount of time spent each month with out an internet connection. This is also a useful tool to keep an eye on the uptime of a remote server/device. Internet Downtime Logger is designed to run on Debian based systems but can also run on wide variety of UNIX-like operating systems including most Linux distributions, Mac OSX, and even iOS provided you have all the dependencies installed. You may have to force install the deb on other systems which use different package names to get around the dependency check. Download the .deb and install it, run Internet Downtime Logger with the following command. You will then be asked to configure Internet Downtime Logger for the first time if you do not already have a config file. You can restart the setup at any time by running the following command. You may run Internet Downtime Logger automatically at startup, it will not count loss of power as internet downtime.